I am declaring this the summer of incredible, simple meals!! 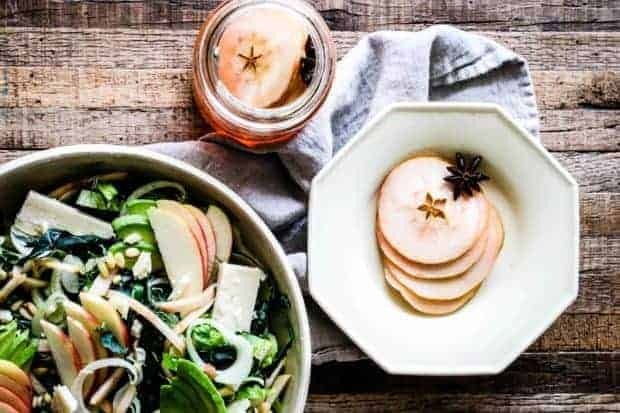 With a cross country move from Long Beach, CA to Atlanta, Ga in our very near future I am looking for easy meals that are customizable to my family’s needs and that don’t take a ton of time like this Spiralized Apple Salad! There are 2 ingredients that I like to keep on hand at all times for my kid’s to snack on, Stemilt apples and celery. They both taste amazing, they eagerly eat them, and they’re really good for them too. Plus, those ingredients do double duty in one of our new favorite summer dishes, this Spiralized Apple Salad! This salad is not only easy to make, with ingredients that I typically have on hand, but unlike some salad’s this one is super kid-friendly too. My kids love all of the ingredients, even the apple cider poppy seed dressing, and they love when I add sliced grilled chicken breast on top of it too! Salad’s like this one don’t have a lot of rules that apply when you are making them, but I do have a couple of tips to keep your salad bright and crisp! No spiralizer, no problem. 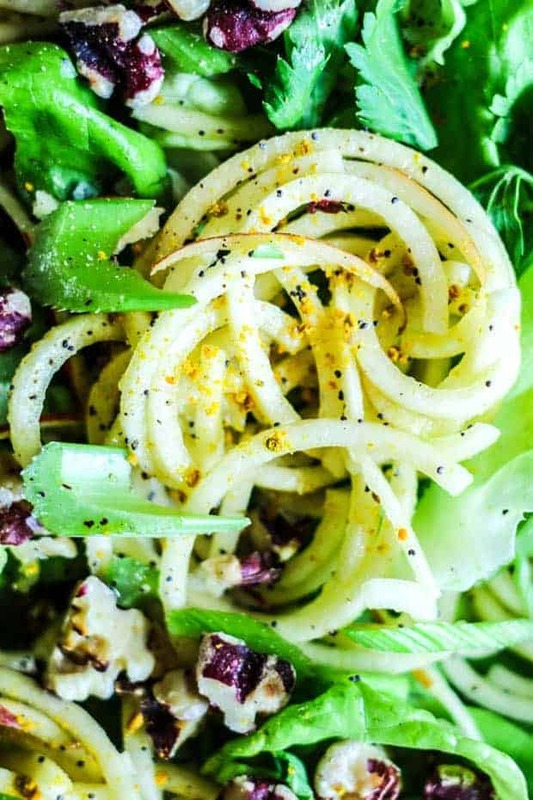 || Spiralized noodles are super fun for my kid’s to make and eat, but you don’t have to own a spiralizer to make this salad! All you have to do is serve this salad with thin slices or matchsticks of apple instead. Browning apple noodles would be a pity. || Whatever way you slice your apples though be sure to toss your apple noddles with 4-5 tablespoons of the dressing before you pile them onto the greens. This will keep your apples from oxidizing and will actually ensure a perfectly dressed salad with nice crisp greens and lots of flavor! Want to mix it up? || This salad is customizable in so many ways!!! Which basically means this recipe will never ever become boring to your kid’s or to your tastebuds. 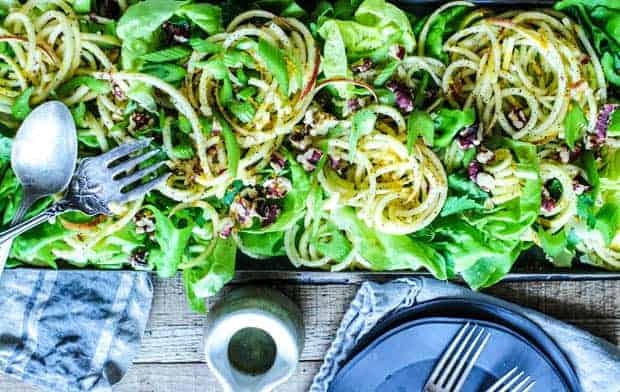 While I am sure there are a bazillion ways to swap up the flavors in this Spiralized Apple Salad, I thought I would also share a few flavor swaps that are on our “to-try” list with this salad over the summer. 1. Add goat cheese or even chunks of a good sharp cheddar cheese. 2. Substitute shaved fennel for the celery to add a fun licorice scented twist. 3. Add herbs!! Seriously, nothing takes a recipe to the next level quite like fresh herbs. I’m thinking basil, thyme, or even a bit of mint in this salad instead of the celery leaves. I promise you won’t regret it! READY TO PUT A FRESH SPIN ON YOUR SUMMER SALAD ROUTINE? SIMPLY CLICK HERE TO GO TO THE STEMILT WEBSITE FOR THE RECIPE! 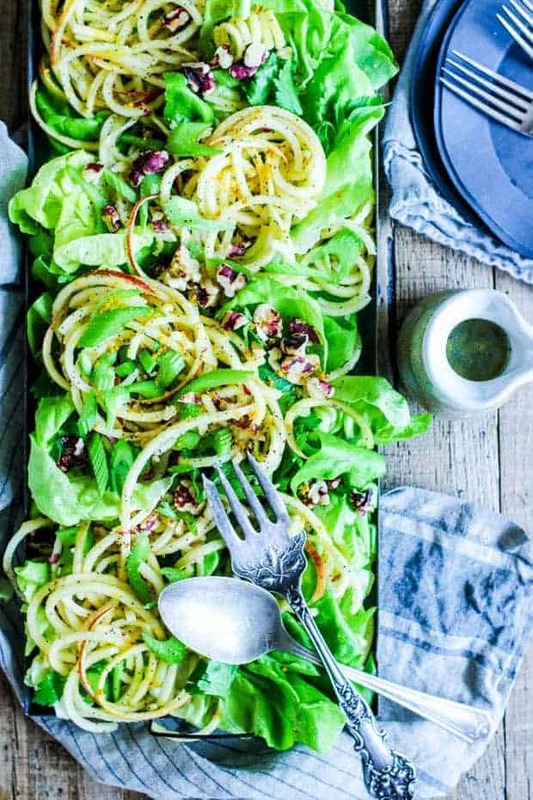 If you’ve tried this Spiralized Apple Salad or any other recipe on our site then don’t forget to let me know what you thought in the comments below, I love hearing from you! You can also FOLLOW ME on FACEBOOK, INSTAGRAM, TWITTER, and PINTEREST to see more delicious food, design, and decor. Want to see what else we have been cooking up with Stemilt’s apples? Click on the links below for the recipes! 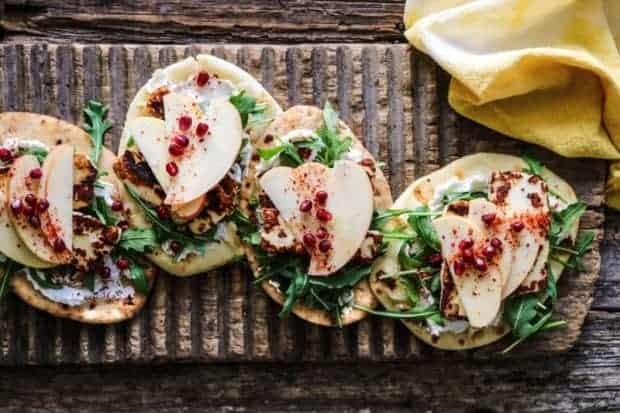 Apple Halloumi & Labneh Flatbreads|| I chose to use Stemilt’s Piñata Apples in these flatbreads because they are literally a flavor explosion for the taste buds. They have a bit of a sweet meets tart tropical vibe to them that we just love. And they bring a much needed crispness to these flatbreads. Quick Pickled Apples || Stemilt’s Pink Lady apples are the perfect apple for pickling because they are very firm and dense in texture and have a wonderful tart flavor that I just love! 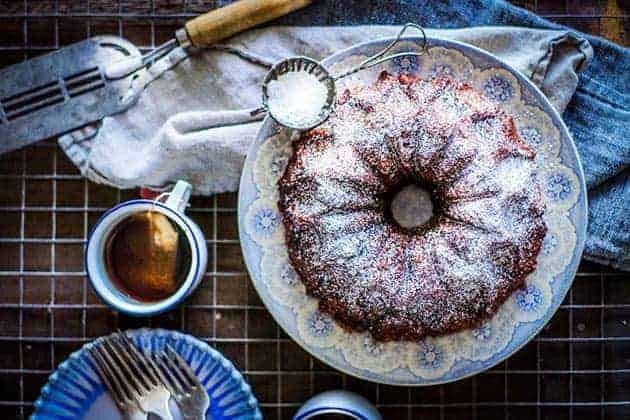 Apple Chai Monkey Bread || This Apple Chai Monkey bread comes from a recent cooking session with my daughter and I think it might just be the most delicious thing we have ever made together. 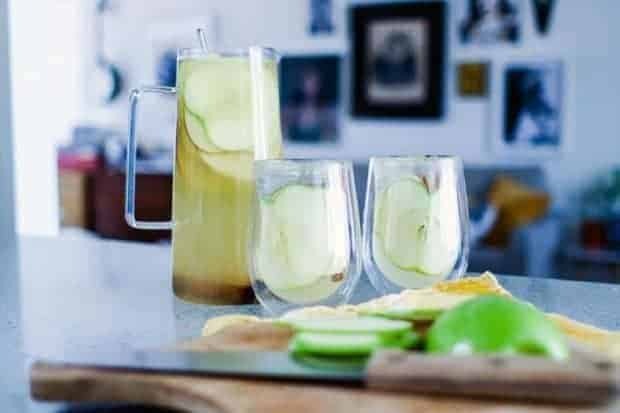 Apple Ginger Sangria || When the weather starts to heat up I like to put my favorite Fall forward flavor combination of apples and ginger on ice with this super easy sangria for summer! I love salads… I really do LOVE them (I could eat them every day, truly). The one thing I struggle with is differentiating them. This apple salad is definitely a new one for me, and I cannot wait to try it! I agree, salads are great, but sometimes its easy to get stuck in a salad rut! 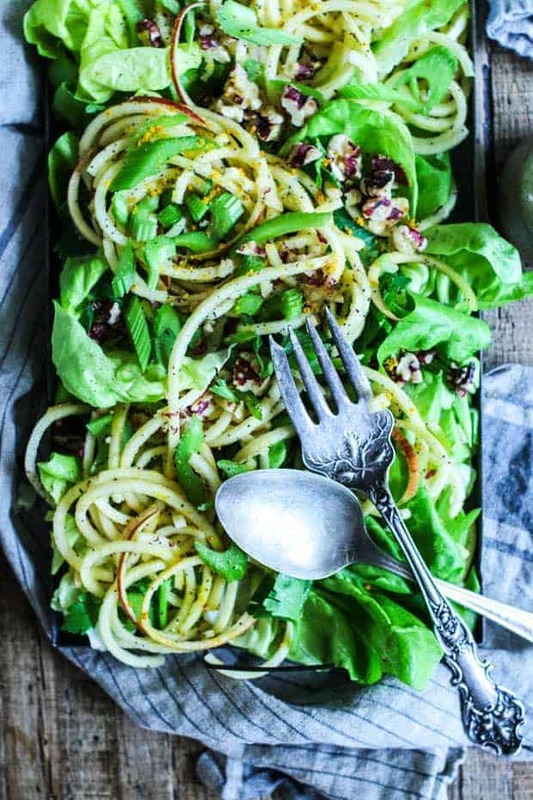 I hope you love this spiralized apple salad as much as we do, its definitely a fun way to swap things up.